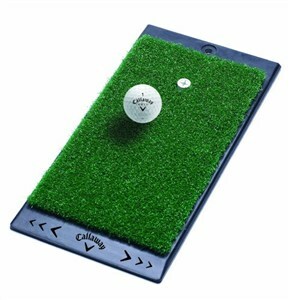 For a more substantial net that can take a beating, check out the 3' x 5' Dura-Pro Plus Residential Golf Mat. This bad boy ain't going nowhere (as my 2nd grade teacher used to brag on me). Go ahead and hit it fat or skinny or just right. The Dura Pro costs more, but it will last longer, and it comes with a bunch of free booty like a cool tray, balls, tees, etc. Plus, you get to keep your neighbor's lawn mower for another couple months.